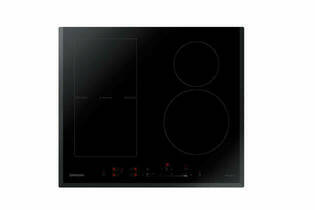 Snapshot: The Samsung NZ64H57479K/SA induction cooktop has four cooking zones, which includes a flexi-zone. How well does it cook? Four cooking zones in a range of sizes (includes flexi-zone). Good cooking zone layout (flexi-zone at left, small at back). Three cooking zones can be used simultaneously. Controls too close to cooking zones.